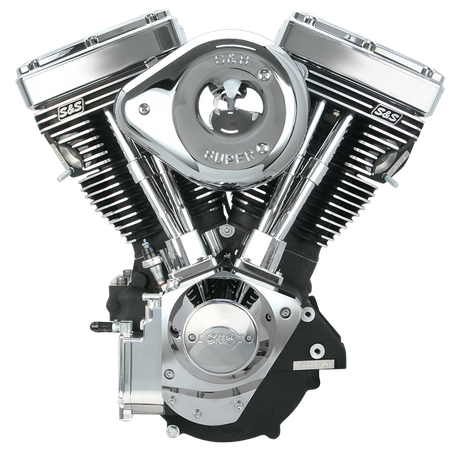 The S&S 124 cubic inch V124E engine is 49-state emissions legal and is intended for "new build" custom bikes built with a new 1984-'99 style aftermarket frame, and is not to be used in a previously titled vehicle or custom bike built from a previously titled vehicle. This engine comes with an S&S Super G carburetor with the Classic Teardrop air cleaner cover. Finished in black wrinkle power coat with chrome gearcover, tappet covers, and rocker covers. The S&S Super Stock® ignition system protects engine with a low rev-limiter during first 24 hours of operation, and logs engine data that can be viewed via a PC when equipped with diagnostic cable and software part #55-1271. The ignition is initially configured for electric start, however, it is kick start capable. Engine comes with all required certification, documentation, and labels Two-year warranty. These engines are not to be used in a previously certified vehicle or a custom motorcycle built from a previously certified vehicle. S&S 49-state engine packages are only available through S&S dealers and select distributors. Requirements for bikes built with S&S EPA certified engine packages: Vehicles must have a maximum N/V ratio* of no greater than 43.3 for V-Series engines. Maximum vehicle curb mass for V124E and V111E engines is 1058 lbs. Exhaust system selected must create back pressure within the specified limits. Min. 3" H20, Max. 21" H2O *Engine rpm divided by miles per hour in top gear.